Brachial plexus injury and palsy in the hand due to injury of the upper and middle trunks, reconstructed due to bullet wounds. Open reduction internal fixation fractures of the second and third metacarpals due to bullet wound. Bullet wounds to the hands and upper extremities frequently cause significant damage because of the concentration of nerves, tendons, ligaments, bones, joints and arteries into small areas. 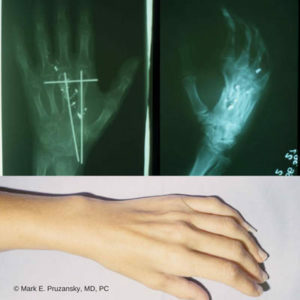 Injury to any one of these can impair the function and viability of the digit or part of the extremity. Initial care consists of cleaning the wounds, controlling bleeding, and stabilizing fractures. Evaluation and management of the entire patient including vital sign management has first priority. Entry and exit wounds are identified. The latter generally show eversion of skin and soft tissues around the wound. When only one entry site wound is noted, then the bullet will need to be located at least by x-ray exam to consider its location and the implications of leaving the bullet or removing it. Low velocity bullet wounds, such as those from handguns, which in some cases leave underlying structures intact, are often treated with cleaning the wounds, dressings and antibiotics. High velocity bullet wounds, which generally are caused by rifle injuries, create a soft tissue shock wave that causes extensive damage away from the track of the bullet. These cases generally require surgery in order to remove devitalized tissues from the area of the bullet track and surrounding shock wave. This minimizes the possibility of infection and optimizes future function. At the same time damage to structures such as tendons, ligaments, bones, nerves, and important arteries and veins are repaired. Retained bullets may mechanically interfere with the movement of bones, joints, and tendons, when this occurs the bullet or fragments require removal. When a bullet is in a joint, it generally needs to be removed not only for mechanical reasons but also to avoid lead poisoning. Patients with bullet wounds generally receive antibiotics and tetanus coverage. Deflection of a bullet within the arm may occur as it ricochets. The bullet can fragment and cause damage over a wider area, even a low velocity bullet. The bullet can pass through the extremity and into another part of the body and this needs to be established and treated appropriately. The hand surgeon is trained to repair bullet injuries in the fingers, thumb, hand, and upper extremity to the brachial plexus. Occupational and physical therapists are essential in rehabilitating the patient and optimizing their function.